This page contains a single entry from the blog posted on August 21, 2006 8:51 PM. The previous post in this blog was Sight for the week's end. The next post in this blog is Videos targeted at teen girls are design-obsessed. One might think after being skewered by SUV haters for its create-your own-Tahoe commercial promotion, Chevy would steer clear of featuring the much maligned vehicle in its next consumer generated media folly, Reduceuruse. But no. 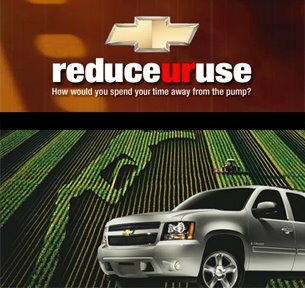 Smack in the middle of a cornfield on a page about E85 fuel is, yes, another Tahoe causing one to wonder if the Tahoe is the only vehicle that runs on this corn syrup. The Reduceuruse site is being promoted by a low quality video-style commercial featuring a man with a bucket on his head, squatting in front of a baseball pitching machine. Every time he gets hit with a baseball, he turns the bucket around, and it ends with Chevy boasting their great fuel mileage and asking "How would you spend your time away from the pump?" Please, leave the quasi-viral video commercials to Vonage. Reduceuruse is another try at the consumer-generated-media audience. Though, when visiting the site, it's not very clear what they're looking for. I'm sure it's buried somewhere deep in the extensive terms and conditions. Apparently, your supposed to submit a mobile video showing what you'd do when not at the gas pump, like, getting hit in the head with a baseball.